Product prices and availability are accurate as of 2019-04-15 18:09:16 EDT and are subject to change. Any price and availability information displayed on http://www.amazon.com/ at the time of purchase will apply to the purchase of this product. 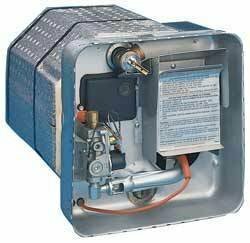 SUBURBAN 5243A SW10DE 10 GALLON DIRECT SPARK WATER HEATER WITH ELECTRIC ELEMENT Take advantage of campground or generator power to heat your water. A 1440 watt Incoloy electric element provides a recovery rate of 6 gallons per hour. For a FAST recovery rate of 16.2 gallons per hour, both gas and electric can be used simultaneously. PRODUCT FEATURES: * Porcelain-lined steel tank for long life. * Replaceable anode rod provides further corrosion protection. * FAST recovery rate. * Convenient exterior gas line connection. * One-piece, die formed metal control housing protects controls from the weather. * Copolymer insulation jacket specially fitted to the tank to retain heat. * 3 year warranty. PRODUCT SPECIFICATIONS: * 12,000 BTUs * Dimensions: 16-7/32'' Height x 16-7/32'' Width x 20-1/2'' Depth * Cut-out dimensions: 16-3/8" Height x 16-3/8'' Width 5243A replaces the 5063A as well as the 5126A, per Suburban - May 2017.